Even before J.P. Morgan, Henry Clay Frick and the other U.S. industrialists whose names are today synonymous with museums began amassing art, there was William T. Walters. Beginning in the 1850s, this whiskey merchant and railroad magnate started a collection that became the Walters Art Museum here, whose 35,000 objects span ancient Egypt to the early 20th century. Yet his story and that of his son, Henry, who followed his father's lead and then bequeathed their trove to the city, is far less known. "From Rye to Raphael: The Walters Story," which opened this fall to celebrate the museum's 80th anniversary as a public institution, is a welcome and fascinating, if slightly flawed, corrective. To tell its creation story, the museum has filled its fourth floor—normally home to 19th-century paintings, a gallery for prints and drawings, and some decorative arts—with more than 200 works of art, purchased internationally, that show the tastes and passions of the father-and-son duo. Some are always on view; others were pulled from storage. They are supplemented by photographs, archival documents, monogrammed china and a 19th-century whiskey bottle. William Walters developed his penchant for art because his mother said it would make him a better citizen. He began buying and commissioning American art (mostly), often with a moralistic message, to display in his townhouse. A classical, life-size marble that stood at the base of his grand staircase, William Henry Rinehart's "The Woman of Samaria" (1862), dominates the introductory gallery of his early purchases. With a draped blouse baring her shoulder, she is the fallen woman who, during their conversation at a well, recognizes Jesus as the Messiah. Walters championed Rinehart and bought many pieces from him. On a nearby wall, "The Scarlet Letter" (1861) by Hugues Merle illustrates why this French artist was a rival to famed realist painter William-Adolphe Bouguereau, who is renowned for his rendering of, well, female flesh. Here, Hester Prynne, protectively clutching her illegitimate daughter in a Madonna-and-Child pose, is a symbol of the redemption that can follow sin. Nice, but not quite Bouguereau. Morality and religious themes pop up occasionally throughout the exhibition—notably in the next gallery, where Delacroix's "Christ on the Sea of Galilee" (1854) and "Christ on the Cross" (1846) hang—but father and son also collected landscapes, among other things. They started with canvases like "The Catskills" (1859), commissioned from Asher B. Durand and a fine, representative work by this charter member of the Hudson River School. But after the Civil War broke out in 1861, enveloping Baltimore in turmoil, the Walters family fled to Paris, precipitating a change in taste. Upon their return, William sold many American paintings—including "Twilight in the Wilderness" by Frederic Edwin Church, which is now owned by the Cleveland Museum of Art—and started to focus on French paintings (by Ingres, Gerome, Millet, Breton, Daubigny, etc.) plus works by a few other European artists. Initially, Henry Walters tended to buy what his father bought, less successfully. He purchased three more works by Delacroix, for example, and "Marphise" (1852)—a fable depicting virtue triumphing over beauty and not normally on view—is a bit of a muddle. It looks as if the artist could not get the central image right, whereas "Sea of Galilee"—bought by William—is powerful and crisp. 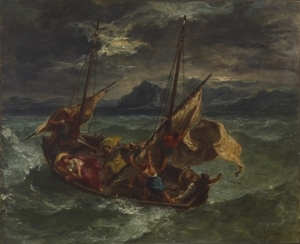 Henry's other Delacroix works remain in storage. Henry got better, though, especially once he envisioned the collection as a museum for the public. In a long gallery filled with landscapes, the acquisitions are fairly evenly matched. Both men seemed to admire storm scenes, mountains, clouded skies. 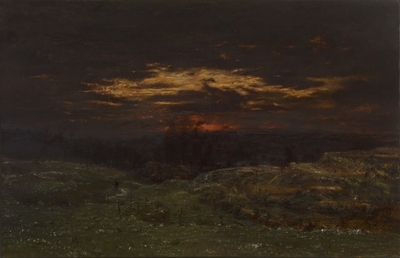 An interesting tale surrounds Théodore Rousseau's "Hoarfrost" (1845), a cold, dark sunset picture, with one small figure traversing a field dotted with white, the only light provided by a break in the clouds. William first bid on it in 1880, unsuccessfully. Two years later, ready to spend more, he paid more for this painting than he had ever done before. Then he gave it another name, "Winter Solitude." Around 1900, Henry veered away from Barbizon school works and bought some by Impressionists—Monet, Sisley, Pissarro and Boudin. He bought a J.M.W. Turner—"Raby Castle, the Seat of the Earl of Darlington" (1817)—a rather traditional house painting, with fox hunt, distinguished by its dramatic sky. In 1909 and 1910, he also purchased an atypical—for him—brushy cafe scene by Manet and a racehorse scene by Degas. Comparatively small works, they were never hung by him, but they are on view here. Henry also came into his own buying decorative arts and jewelry at World's Fairs, particularly those in Paris in 1900 and St. Louis in 1904. A small gallery here is filled with these purchases. Among the most stunning are an ivory-and-gold orchid comb, the central vein of each leaf lined with diamonds, and a gold, glass and enamel pansy brooch—both by Rene Lalique. Also of note is the re-creation of a gallery, hung salon-style from ceiling to floor, that William Walters had opened to about 200 invited artists, dignitaries and friends as early as 1884—an event heralded even in New York. Later, the collection was opened on certain days to the public, with proceeds going to the poor. So what's wrong with this show, other than the fact that the Raphael of the title, "Madonna of the Candelabra" (c. 1513)—the first Raphael to enter a U.S. collection—is downstairs in the permanent-collection galleries? Some 70% of the museum's collection was purchased by William or Henry, and selecting what to single out for this installation must have been difficult. Parts of their story had to be left out: There's no mention of their antiquities or Renaissance purchases, for example. Yet here and there the curators have added works that were not owned by the founders—and sometimes for the wrong, politically correct reason. This flaw starts in the very first gallery, with "River Scene" (1868) by Robert Seldon Duncanson, which was bought by the museum in 2012, and a bust of Dr. Dio Lewis (1868) by Edmonia Lewis, purchased in 2002. Both are fine works by African-American artists, but neither has anything to do with the founders' story. To my mind, this kind of attempt to be "inclusive" is not only condescending, but also a distortion of history. Rather than being intermixed, those works could easily have been shown in the final gallery, titled "Continuing the Story," which displays gifts and purchases made by the museum after Henry died in 1931.